Rest in Peace dear Jax! Stonelick Covered Bridge in Clermont County OH is an icon for many. Recently restored, it is a beauty! I spent hours trudging around the bridge, bushwhacking through the waist high scrub, scrambling from rock to rock in the creek-bed and shooting photos from every angle, at different times of the day, over a period of a month. The reference photo used for this piece was taken at 5:00 on a fall afternoon. The sun washed bridge vs. deep shadows cast by the trees as the sun descended, made it interesting as well as a challenge. My client is a covered bridge enthusiast, so every detail, down to the numbered sign, is meticulously rendered. The original measures 20x30" and was painted with various brands of lightfast colored pencils on rag matboard. Fine Art Giclees are available for sale. Contact me for details. Something I'm working on... Anubis. So far 32"x24" on Crescent Rag mat board with Prismacolor french grays. My ref photos taken in Cape May NJ. I have always been fascinated by Horse Shoe Crabs. They used to litter East Coast beaches, where I spent many happy summers as a kid. Creepy and a little like Darth Vader's helmet, they are ancient. We are a mere aggravation on their long, long, time line. The idea of this figure as Anubis, (you might want to look this up- the god Anubis, often depicted as the scale of justice, decides who gets into heaven or hell,) has been percolating in my head for three years. A disadvantage of a back-burner, (forgive the cooking metaphors- I didn't eat breakfast,) a slow cooked idea, can go many different directions. It can be simple and to the point like a good crusty bread, multilayered like marinara, or tricky like pie crust. Then I get it started on a new piece of board and see possibilities start poking holes and burning the edges of my plans. This latest drawing -painting uses all my technical tricks to tell a story. You will notice the rich color and texture of the red coat in contrast with the barely there background. It is 27"x20" colored pencil on rag mat board. I haven't decided on the title. For now I'm calling it "On The Bridge" It was conceived while visiting The Brooklyn Bridge last November. I came upon this scene and found it interesting. The bridge itself is an amazing place to visit- all those cables slicing patterns through the New york sky. But it was the gush of human traffic over the bridge, people from all over the world, some commuting, some tourists, some on foot, some on bikes, I found most fascinating. In this scene you have the juxtaposition of three self absorbed young girls taking a group shot with a smart phone, while a serious young woman photographs scenery with her SLR and zoom lens. The progression of technology- what is gained what is lost? The three girls capture three faces, together in the place, in the moment, while the more mature woman takes photos of what is beyond. In addition, I like the humor in this scene. You have me taking a reference photo of a young woman taking a photo in front of three younger women taking a group selfie, all of us standing on the same bridge seeing completely different things! My painting "Who Rescued Whom" was published in Strokes of Genius 6, by Rachel R. Wolf, Northlight Books, hitting the bookstore shelves as we speak. My painting "Departing" earned second place at the CPSA District Chapter 119 exhibition, showing now until the end of the month at The Clifton Cultural Arts Center in Clifton Oh. That's it for now, but there is always room for more. This little 9x19" piece of Bailey's Island Maine (or near there anyway) was painted from one of hundreds of reference photos taken there this summer. My husband and I were guests of some dear old friends. They kindly tolerated my habit of banging through the kitchen, making coffee at the crack of dawn, so I could scramble around their property with the camera. Once they arose at the alarmingly late hour of 10:00 am, they drove me up and down the coast, combed beaches and took me out on their boat to find Harbor Seals. I didn't waste one second of my time there. I painted this little gem to fit a skinny gold leaf, antique frame given up by its previous owner. (I'll post a photo of the finished version, once the rest of the materials are in. ) It is fun to use the occasional woopsies and discards. I have a strong need to repurpose stuff. Given a predetermined size, color pallet and style, forces me to change up my routine. It's an interesting exercise. 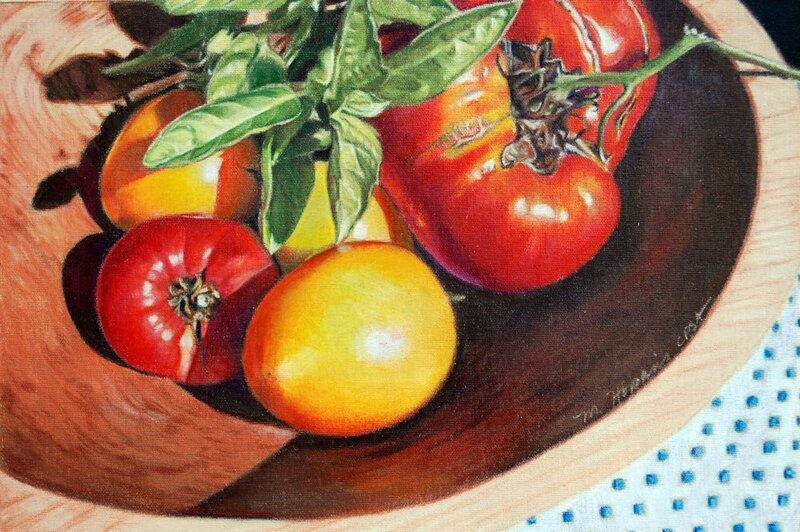 Coming soon in Ann Kullberg's Hidden Treasures II, "Waiting"
This is "Waiting" 30x16", Prismacolor, Bruynzeel and Luminance pencils on rag mat board. I'm excited about this folks! This means I become a CPSA Signature member! Rags, Ginger and Stewie are excited as well: my three beloved rescues who've managed to make it BIG.